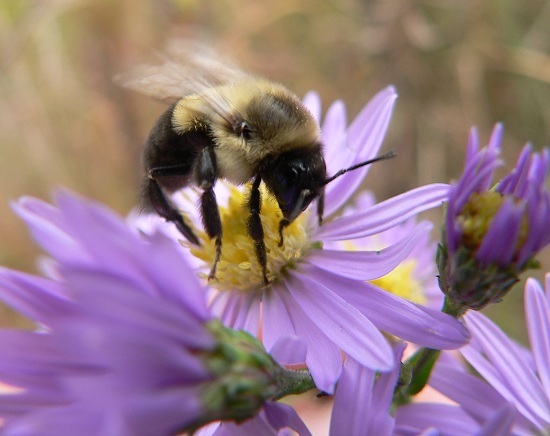 This is the very end of the blooming season, so most of the flowers blooming now are purple and white asters. 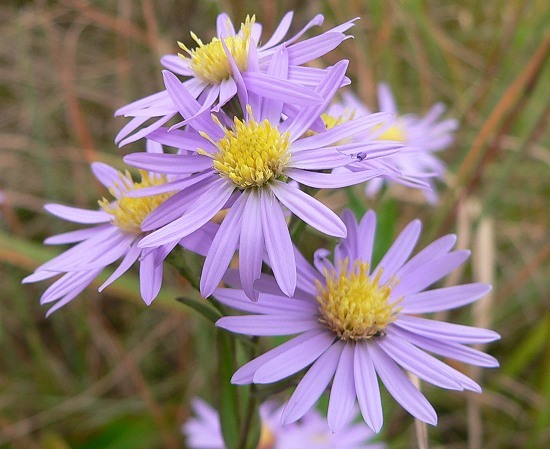 And Smooth Blue Aster (Aster laevis). 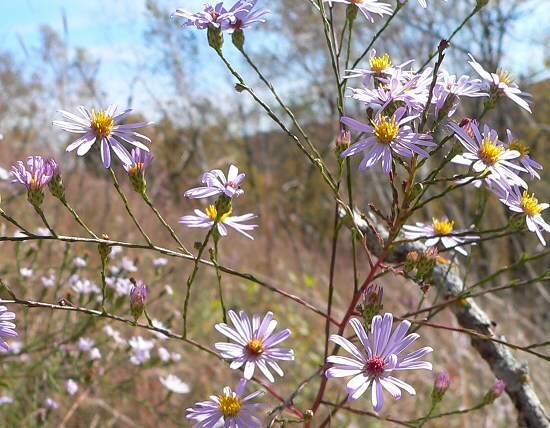 Smooth Blue Aster is less common on our land, but I’ve planted a lot of it in our prairies. 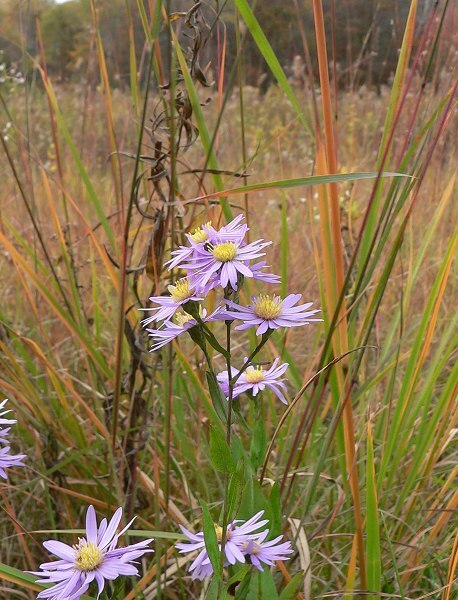 It has larger flowers, and looks beautiful with the brown and orange and yellow of the fall grasses. Smooth Blue Aster flowers with a bee. 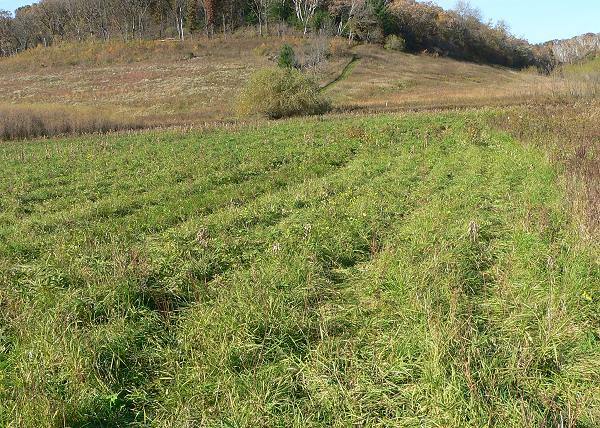 We sprayed the eastern quarter of Milkweed Meadow with roundup – it’s the part of the wetland that has lots of Wild Parsnip but also lots of milkweed. We’ll probably have to spray it again next year to get rid of the parsnip, and then we’ll plant it with wetland seeds next winter. I’m planning to plant lots of milkweed seeds, so I hope we can attract as many butterflies as we do now. 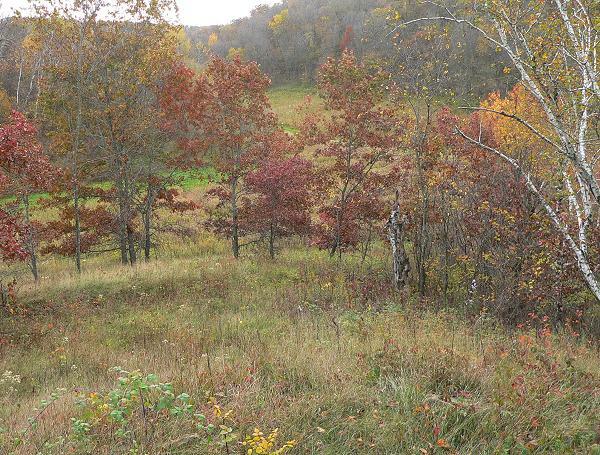 This is the area we sprayed – it looks a little yellowed, but the grass hasn’t really started dying yet. 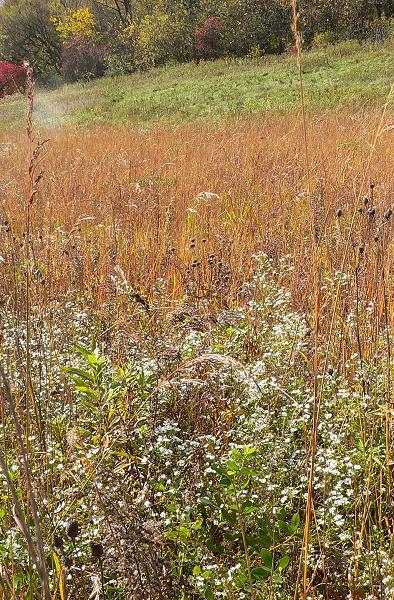 Center Valley Prairie has lots of Indian Grass (Sorghastrum nutans), Frost Aster (Aster pilosus), and White Wild Indigo (Baptisia lactea). I walked up to Big View Prairie to check on the Great Plains Ladies Tresses (Spiranthes magnicamporum). 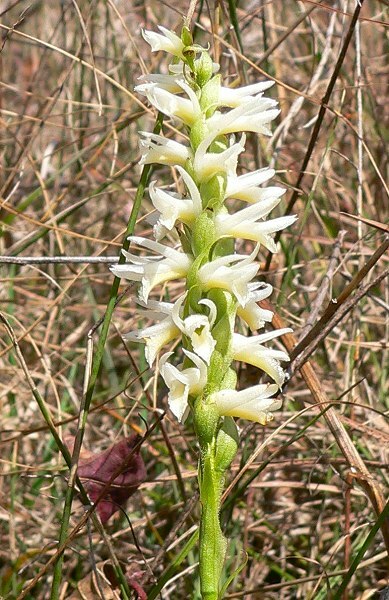 They are orchids that grow in the dry remnant prairies around here. 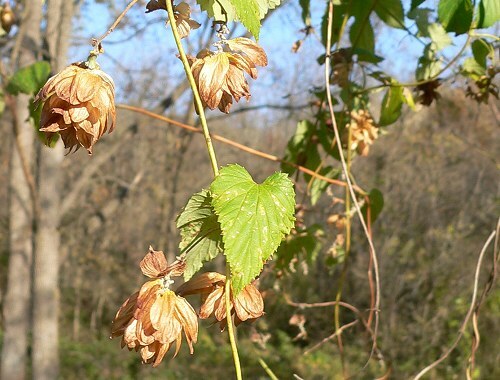 The leaves come up in the summer and die back before the flower stalks emerge in late August. The flowers have a strong Lily of the Valley-like smell. 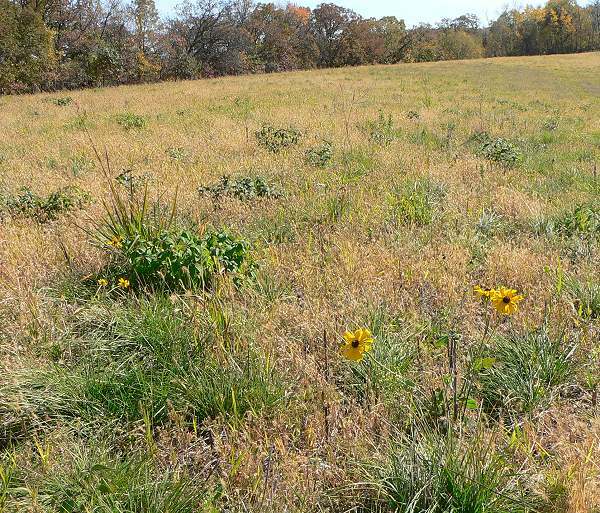 This is Buffalo Ridge Prairie. We mowed it in the middle of the summer, so the prairie plants are short, but they’re growing and even flowering. We spent a few mornings logging dead aspens on Indian Grass Point. 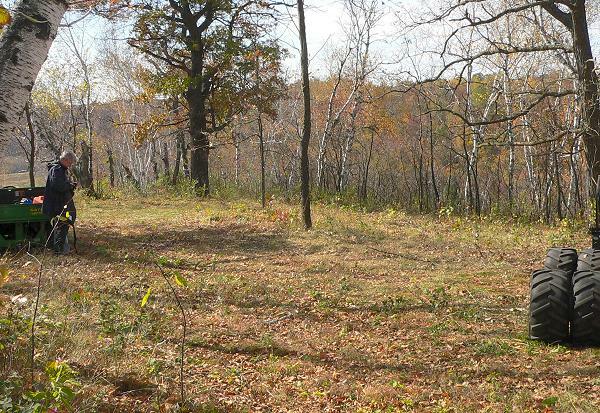 After enlarging the clearing that we’ve been making, we realized that we only need to go a little farther to get to a nearby remnant. We’ll try to get there next week – it will be fun to have an opening all the way though. This is the opening so far. We have Hops (Humulus lupulus) growing in several places on our land. It’s a vine and the flowers are used as a flavoring in beer. There’s some debate about whether it’s native to North America, or whether it has escaped from cultivation. Here it is in one of our ravines. I visited Hidden Oaks Point today – we cleared out most of the brush two years ago, and prairie plants are starting to come back. 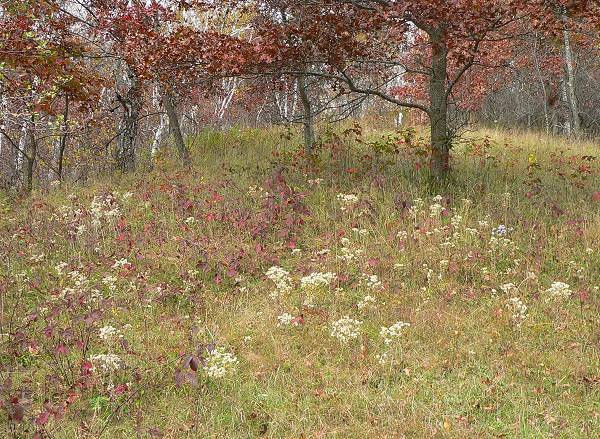 Here’s a photo looking up the hill, with some of the oaks turning color, and the cream-colored seed heads of Sweet Everlasting (Gnaphalium obtusifolium). This is the same area looking from above, and beyond it into 3 Finger Valley.